How easy can it be to start selling online? Most small businesses find technology always a daunting challenge. 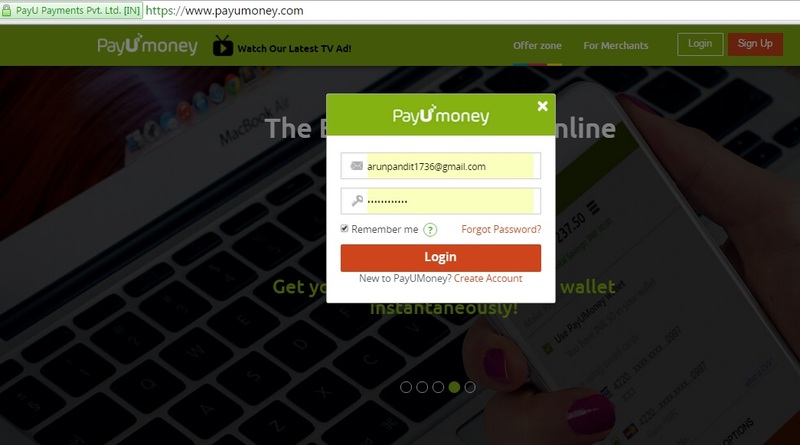 This is what drives us at PayUmoney to build tools which make online payments trivial. 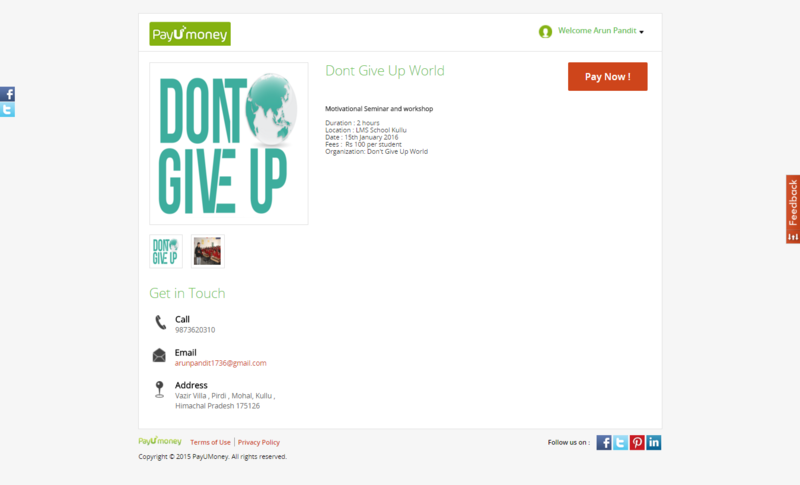 PayUmoney provides built in support to collect payments for different utilities. You can now easily accept online payments for school fees, housing society fees, hotel room fares, fund raisers, events, sponsorships and bill payments to name a few. You can quickly track your PayUmoney transactions, payments received , refunds and other information from your merchant dashboard. You can also access it on the move through our android seller app. Lets get your web front ready! Follow the below steps to get your web front ready. 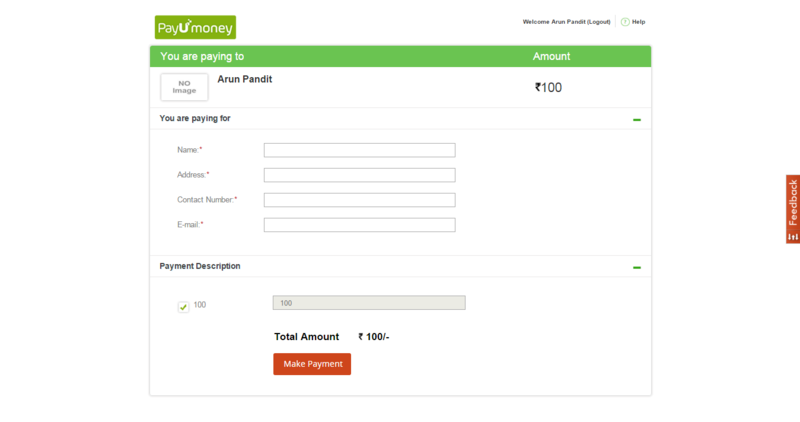 You are now on the PayUmoney merchant dashboard. 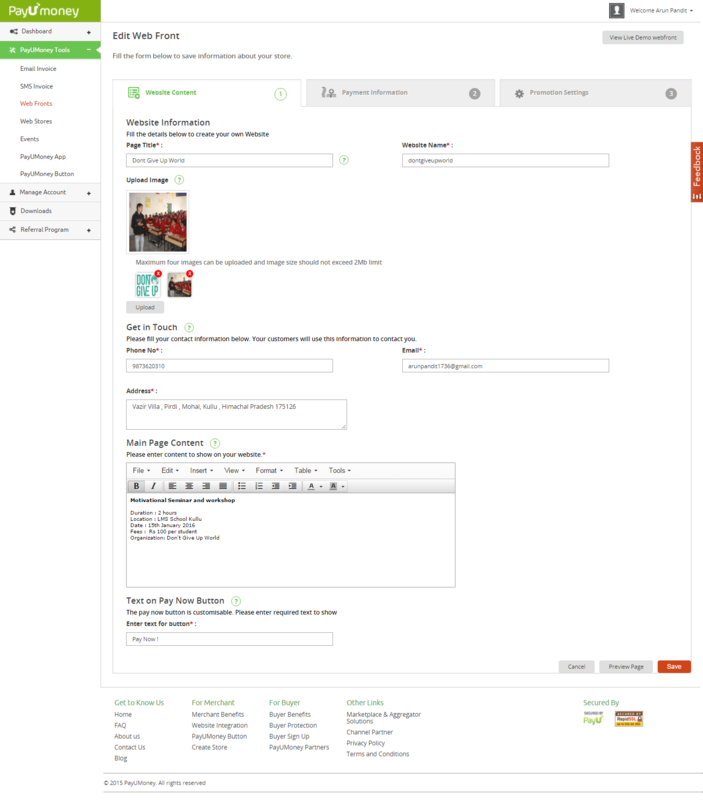 Select the webfront option from the PayUmoney tools section on the left. Click “Create Front” button. Text on the pay now button. Save after entering the information . In this section you select the data that you want from the customer. Eg: their name, address, contact number, e-mail id etc. You can choose to make these fields mandatory. Please mention the amount to be collected. This amount can be a predefined amount or you can even give the customer an option to fill the amount on their own. Save after entering the information. You can share and promote your social media accounts. Share the urls of facebook, twitter, pintrest and Linkedin with your customers. Save and publish after entering the information. Your webfront is ready to go LIVE! How to promote your webfront? 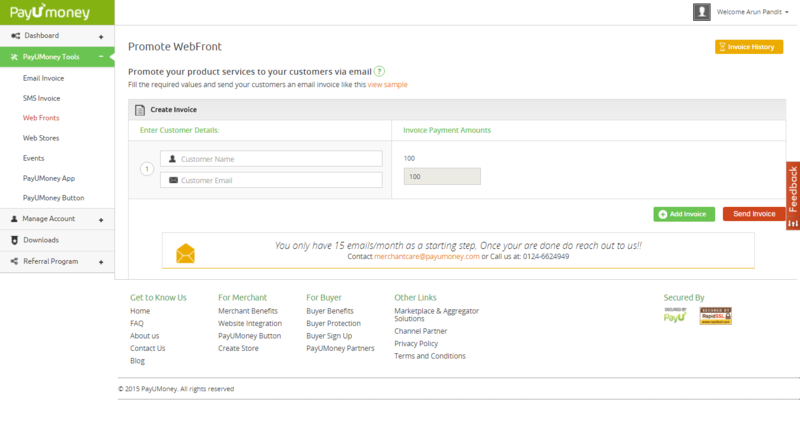 You can share your webfront details to your customers by sending an e-mail invoice with the “promote your webfront” option. 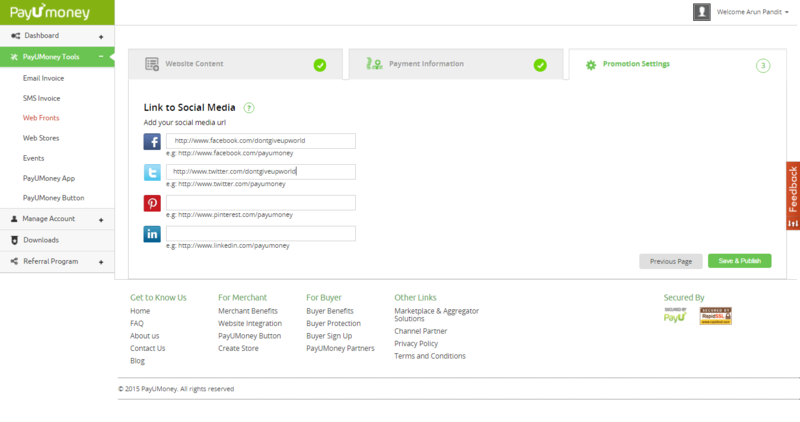 Many sellers selling on facebook/ whatsapp also share their webfront links to collect online payments. View the webfront by clicking the webfront url. 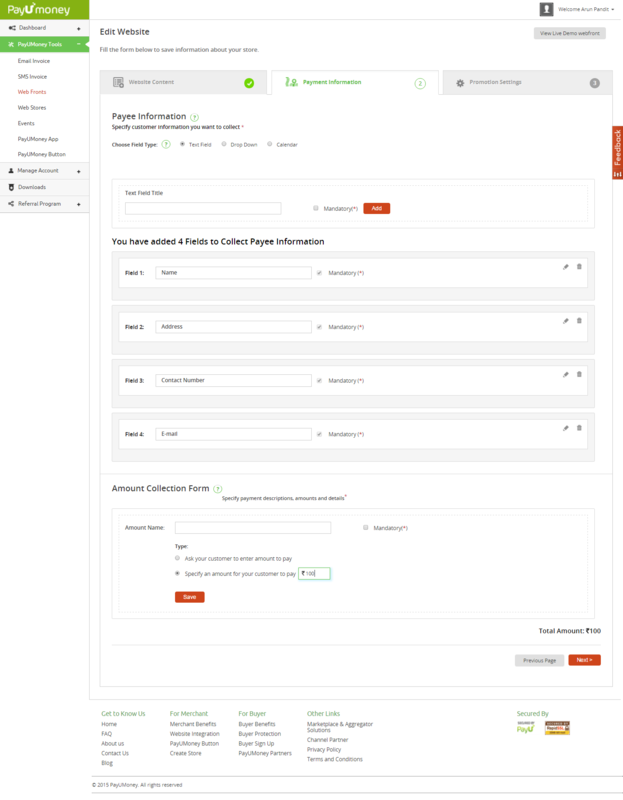 Click on the “pay now” button to verify that the input fields and payment description are as per requirement . Start taking online payments via webfront. Click here to register as a merchant on PayUmoney. If you have further questions, these FAQ’s are a great resource.